There are no storylines here or poorly relayed personal anecdotes that can be shoehorned into a story about yesterday's Outback Bowl. After two years of getting to and even winning bowl games on the strength of miraculous wins that were unsustainable, it's only fitting that Michigan finally arrive on the other end of the spectrum. Even more appropriately, the secondary, which had been heralded as one of the nation's best, was finally shown to be the straw house that we all suspected it was; the unit that was largely responsible for yesterday's loss. Michigan was outgained badly, lost the turnover battle, revealed a still-inept secondary, and had an offense that averaged only 4.3 yards per play. They deserved to lose and they did. 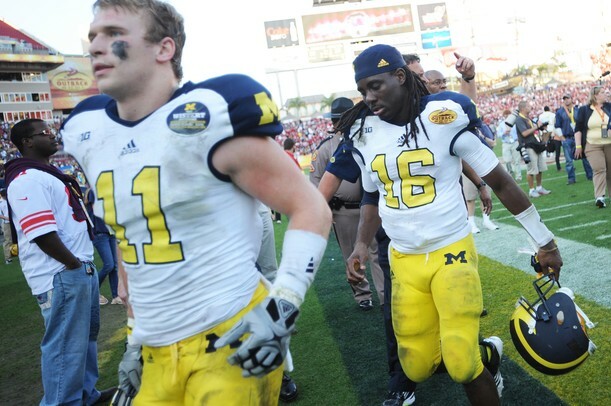 For most, this game marked the final appearance of Jordan Kovacs and Denard Robinson in a Michigan uniform, regardless of the outcome. For me, this is the end of my most frustrating season as a Michigan fan since my senior year (2007). When Rich Rodriguez was the head coach, it was easy to dismiss the losses and near misses: those teams simply weren't very good. There was solace that could be taken in inevitability. This season was supposed to be the swansong of the program's most electric star with a revamped defense and deadly offense. Instead, it was a team that was closer to being 6-7 than 10-3. And in the end, it was the team's defensive anchor who was badly beaten in coverage on the losing touchdown of the bowl game. I'm happy this season is over and Michigan ushers out another class of Rich Rodriguez players. The Borges/Denard transition has been an outright failure, but anyone could see yesterday that Borges has a plan for this offense and there exists a path forward. 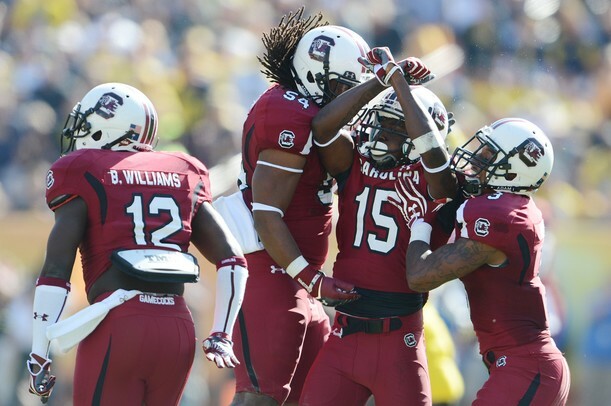 The defense was more distressing--a safety blitz that Mattison dialed up early resulted in an unsound secondary leading to yet another huge South Carolina play, for example. The secondary showed either its lack of talent or lack of experience, getting beaten over and over again for big plays. Raymon Taylor showed his youth, and it may be time for even me to admit that Courtney Avery can't guard anyone in man coverage. Next year, this team only gets better at just about every position save left tackle. The losses of Kovacs, Denard, and Kenny Demens will be covered by players already on the depth charts, while replacements to the likes of Elliott Mealer and JT Floyd will be automatic upgrades. The hardest spot to fill will be Craig Roh--and Taylor Lewan, about which more later--but Jibreel Black has acquitted himself nicely this season and stands primed to slide into the strongside defensive end position next year. Devin Gardner's early flashes of brilliance gave way to the inconsistency that plagued his career to date, but even he will be pushed by Shane Morris early and often during the season. There exists a path forward and Hoke, Mattison, and Borges are leading this team down the right path. The further this program moves from the three treacherous years of Rodriguez recruiting, the better off it becomes. Though the story that most publications will have you believe is one of Jadeveon Clowney flatlining Vincent Smith, the dynamic defensive end was pretty quiet all game because Taylor Lewan was out to get himself some first-round money. Lewan will be the biggest loss of the offseason with only faint hopes of finding an adequate replacement from the collection of freshmen and Michael Schofield. Speaking of NFL monies, Denard can be an NFL running back and probably did a lot of good for his draft stock in this game. What was most impressive about his running from the halfback position was how decisive his cuts were. Obviously, we knew that already, but seeing it from a different position really illuminated how effective he can be at the next level. Brendan Gibbons will be a big asset next season. The Michigan defensive line absolutely dominated the South Carolina offensive line, as evidenced by their complete abandonment of the running game. Remove the one or two blown assignments by defensive ends on the inverted veer, and this defensive front was dominant. Except when trying to sack the QB. Al Borges finally proved he doesn't know how to use Denard with those two-point conversions. The loss of Denard will have one very positive effect on this offense: Borges will no longer fumble around with personnel that he has no idea how to properly utilize. That said, Denard's one pass acted to reconcile some of Borges' shortfallings and the questions about his playcalling: Denard still cannot throw with his injury. If you watched the game on TV, you already know this, but those jerseys were an abject failure. I'm not one to complain about this sort of thing, but the numbers and names were illegible and neon. Hopefully this teaches the athletic department some sort of lesson, but probably not.